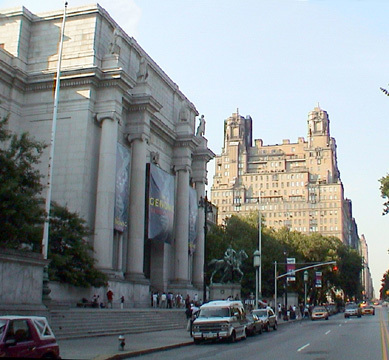 One of the world's greatest residential buildings, this huge structure is distinguished by its three towers and its two major facades, one overlooking Central Park and the other Manhattan Square, the park that contains the American Museum of Natural History. 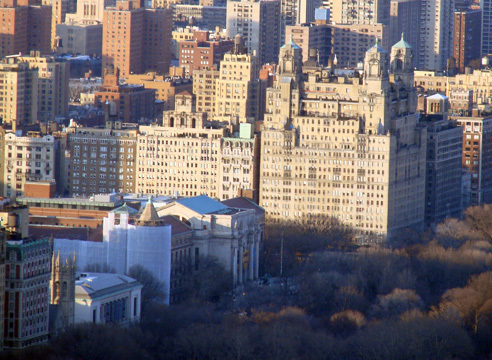 It is one of the masterpieces of architect Emery Roth, who also designed the twin-towered San Remo (see The City Review article) a few blocks south on Central Park West and whose firm, Emery Roth & Sons would design more office buildings in the city than any other firm. Although the building is only 22 stories tall, its presence is significantly more because of its scale. The towers, which have illuminated finials, are quite large and are spaced far apart. Originally, the north tower was open. 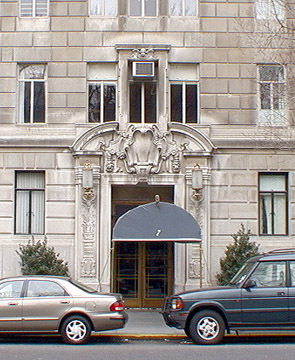 The southeast corner tower contains a multi-level apartment that was occupied for a while by Mike Nichols, the director, and, at another time, by Helen Gurley Brown, the magazine editor, and her husband, David Brown, the producer. Other residents have included Beverly Sills, the opera singer, and columnist Leonard Lyons. In 1998, Jerry Seinfeld, the comedian, bought a duplex apartment in the building from Isaac Stern, violinist, for about $4,350,000. City records indicated in September 2007 that David M. Brown paid $8,400,000 for a three-bedroom apartment next door to another three-bedroom he had purchased in 2004 for $10,500,000, and Vikram Pandit paid $17,850,000 for a 10-room apartment that had been owned by Tony Randall, the actor. Despite its great size, the building is relatively intimate, at least for its residents, as it is divided, internally, into three distinct structures, each with their own separate entrance and elevator. As originally designed, there were only two apartments per floor serviced by each elevator. The apartments were large and ceiling heights were 10 feet for the lower 16 floors and 12 feet for the upper, terraced floors. Many were designed as duplexes and most have fireplaces and the building was one of the first in the city to have glass-door showers with multiple shower heads. Some bedrooms were as large as 18 by 28 feet. The facades are very sophisticated with many elements designed to relieve the monumental scale of the project, which was developed by the HRH Construction Company. 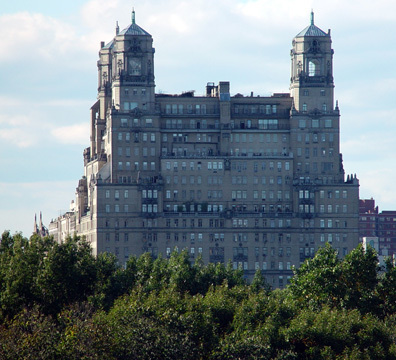 As Andrew Alpern has aptly written in his book, "Luxury Apartment Buildings in Manhattan, An Illustrated History," (published in 1992 by Dover Publications, Inc.,), the Beresford is "a stone symphony." 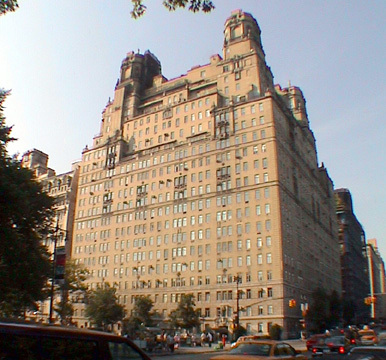 Likening the Beresford to a fortress, Alpern noted that "the grandeur comes in the embellishment": "there are belt courses, stone balustrades, iron railings, rosettes and cartouches (including a large one on the Central Park West façade proclaiming 'Erected 1929'." For many years, the building's windows had awnings, which also helped add dimensionality to the large facades. The building has a three-story limestone base topped by beige brick and the very handsome entrances are highly reminiscent of Italian Renaissance motifs. The lobbies are exquisite and lavish with marbles and moldings and superb, though restrained detailing. The developers thought that three relatively small lobbies would not waste as much space as one very large one. The building replaced the six-story Hotel Beresford that was erected by Alva Walker in 1889 after Jose de Navarro abandoned plans filed five years earlier for four 12-story apartment buildings and the site. In 1892, Walker expanded the hotel with a 10-story annex at 82nd Street and its top floor containing a dining room for residents as the apartments did not have kitchens, noted Christopher Gray in a September 14, 1977 article in The New York Times. 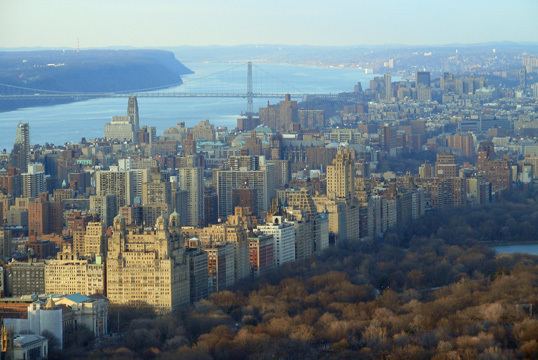 The Beresford, the San Remo and the Dakota are the three most prestigious and spectacular apartment buildings on the Upper West Side. Each has its merits and advocates who claim it is the best. The Dakota, being the oldest, has tremendous history and mystery. The San Remo, being the tallest, has the highest visibility as well as the best location. The Beresford is just overwhelming: the brass elevator doors have a dragon crested shield with a bear and the motto Fronta Nulla Fides (Place No Trust In Appearances). 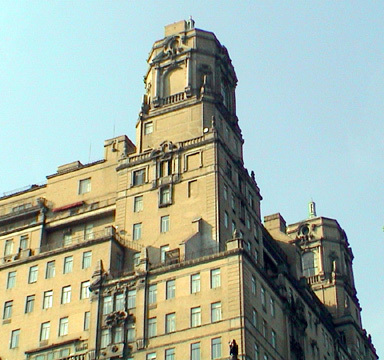 In 1940, the Beresford, which was completed one month before the stock market crash of 1929, and the San Remo were sold together for $25,000 over the existing mortgages, an indication of how severe the Depression was on New York real estate values.